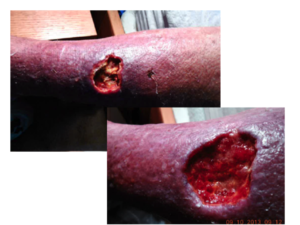 A 79 y/o male with a history of acute myeloid leukemia on palliative chemotherapy (azacytadine) with persistent neutropenia (ANC < 100 over 12 weeks on prophylactic levofloxacin and voriconazole) presents with increasing pain over the right lower extremity. He states a raised “red” lesion developed over the last 2-3 weeks after he “bumped” against a park bench, and this area has progressively increased in size and pain. He additionally states the area of redness, swelling and pain has continued to increase as well. 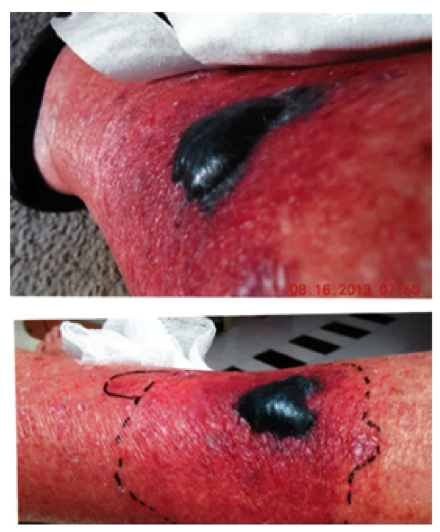 He sought care at an urgent care center and was prescribed a course of oral cephalexin for presumed cellulitis. Following this, his symptoms continued to worsen and he sought care within a nearby emergency room. He states since last seen the area of concern had formed a blister. He was started empirically on broad spectrum antibiotics with cefepime 2gm IV q8hr and vancomycin 1gm IV q12 and transferred to a tertiary care center. His review of systems was pertinent for subjective fever and chills, a scant dry cough, and shortness of breath with any exertion, but he denies all other review of systems. A procedure is performed and the diagnosis is made. What organisms could be the cause of his right lower extremity findings? The spectrum of causative agents in a patient with febrile neutropenia is broad and a definitive diagnosis should be pursued urgently in an attempt to guide therapy. The skin lesions in this patient are consistent with a number of possible etiologies with bacterial and fungal pathogens most likely. The development of a bacterial infection is an important consideration and Pseudomonas aeruginosa often produces the necrotic skin lesions of ecthyma gangrenosum although other organisms (Aeromonas, Clostridium, Enterobacteriaceae, methicillin-resistant Staphylcocccus aureus, etc) can produce similar findings. The duration and severity of neutropenia and/or the disruption of the mucosal barrier (mucositis or an indwelling central venous catheter) are two of the most important factors predisposing to invasive infections in the neutropenic host. This patient had profound and persistent neutropenia and was receiving voriconazole and levofloxacin prophylaxis. AML patients are more frequently placed on posaconazole prophylaxis which has the additional benefit of activity against the Mucorales (the agents of mucormycosis). The surgical findings and culture results confirmed infection with Rhizopus spp in this patient. Areas of involvement were surgically excised (Figure 2). Surgical intervention, for primary cutaneous infection, is a critical adjunct to antifungal therapy to debride necrotic tissue of the involved area. Histopathology and culture also allows for definitive identification of the causal organism and enables the differentiation of mucormycosis from other potential pathogens (e.g., fusariosis, aspergillosis) . The initial antifungal treatment of mucormycosis most commonly consists of a polyene (liposomal amphotericin B or other amphotericin B formulation) pending clinical improvement . Some clinicians advocate for the use of combination therapy with a polyene and an echinocandin for initial therapy based on animal models and retrospective data , although a recent study using propensity scoring showed no benefit with the use of combination therapy . Following clinical improvement and reversal of any correctable immunologic defects, the patient is typically placed on oral isavuconazole  or posaconazole  for for the duration of therapy. Eldridge ML, Chambers CJ, Sharon VR, Thompson GR, 3rd. Fungal infections of the skin and nail: new treatment options. Expert Rev Anti Infect Ther 2014; 12: 1389-405. Spellberg B, Walsh TJ, Kontoyiannis DP, Edwards J, Jr., Ibrahim AS. Recent advances in the management of mucormycosis: from bench to bedside. Clin Infect Dis 2009; 48: 1743-51. Reed C, Bryant R, Ibrahim AS, et al. Combination polyene-caspofungin treatment of rhino-orbital-cerebral mucormycosis. Clin Infect Dis 2008; 47: 364-71. Kyvernitakis A, Torres HA, Jiang Y, Chamilos G, Lewis RE, Kontoyiannis DP. Initial use of combination treatment does not impact survival of 106 patients with haematologic malignancies and mucormycosis: a propensity score analysis. Clin Microbiol Infect 2016. Marty FM, Ostrosky-Zeichner L, Cornely OA, et al. Isavuconazole treatment for mucormycosis: open-label trial and contemporaneous case-control analysis. Lancet Infect Dis 2016; Accepted for publication. van Burik JA, Hare RS, Solomon HF, Corrado ML, Kontoyiannis DP. Posaconazole is effective as salvage therapy in zygomycosis: a retrospective summary of 91 cases. Clin Infect Dis 2006; 42: e61-5.